Each year in June, more than 650 Ripon alumni and guests make their way back to campus to celebrate Alumni Weekend with friends old and new. Keep your calendars open for June 27 – 30, 2019! 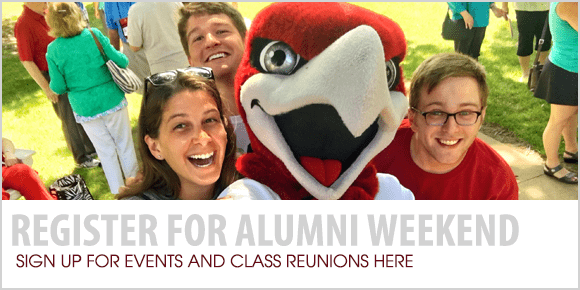 A typical schedule includes class reunions, the annual Doc Weiske ’50 Memorial Golf Scramble, and options for campus tours, socials, activities, reminiscences, and plenty of time to explore campus and connect with each other. Some of our finest scholars and student-athletes will be honored with a Distinguished Alumni Citation, Outstanding Young Alumni Award or induction into the Athletic Hall of Fame. This summer, we will celebrate class reunions for Golden R (1954, 1959, 1964), 1969, 1974, 1979, 1984, 1989, 1994, 1999, 2004, 2009 and 2014! All Alumni Reception, 7-11 p.m.
*All Golden ‘R’ & Class of 1969 alumni guests receive complimentary beer and wine with the purchase of their reunion dinner. Note: Cash bar available at above events without package purchase. 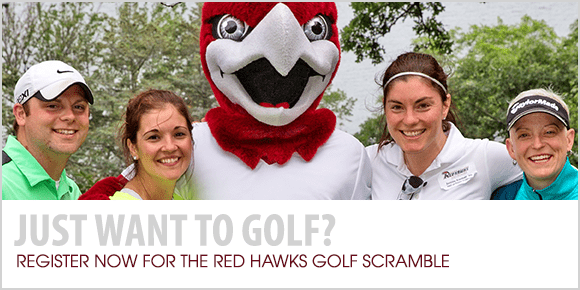 If you would like to register for both Alumni Weekend and the Doc Weiske ’50 Golf Scramble, please elect to register for the entire weekend (left button below). If you want to partake in golf ONLY, please elect to register for the golf scramble (right button below). Open Thursday 3-7 pm, Friday 8 am – 8 pm, and Saturday 7 am – 6 pm. Complimentary drip coffee, decaf and hot tea will be available all weekend. Made to order beverages and light snacks will be available for purchase on Saturday from 7 am – 2 pm. Open Thursday 10 am – 5 pm, Friday 8 am – 6 pm, Saturday 8 am – 4 pm, and Sunday 9 am – 1 pm for Ripon College merchandise and Mugs coffee sales. 10% off coupon available at registration. To assist in planning, MEAL RESERVATIONS are appreciated. Please note any dietary needs or allergies when registering. For LOCAL LODGING, please visit ripon.edu/lodging. ON CAMPUS HOUSING available on Thursday (6/27), Friday (6/28) and Saturday (6/29) nights in Tri-Dorms or Johnson Halls on a first-come, first-served basis for $55 per person per night (single or double occupancy, includes basic linens and pillow). On campus housing is provided to members of the Golden “R” Classes (1969 and all years prior) free of charge. Requests can be made to group reunion years or living groups together. NEW in 2019! On campus guests will be provided continental breakfast from 6:30-8:30 am each morning following their stay. Tri-Dorms and Johnson Hall will remain unlocked throughout the weekend. Guests will be issued keys for their rooms. Keys can be picked up during registration hours or after hours in Johnson Hall. You are advised to lock your room when it is unoccupied. Room keys must be deposited in the orange box near the front desk of Tri-Dorms or Johnson Hall by 10 a.m. Sunday. Linen, towel, soap, pillow and blanket (one per bed) are provided. Children may stay in the same room with their parents. Since rooms are not air-conditioned, you may wish to bring a small fan. When you arrive on campus, please connect to the RallyNet Guest network for all of your WiFi needs. No password is required. The campus ATM is available on the lower level of Pickard Commons near Alumni Weekend Registration at the Center for Career & Professional Development. Our 24-hour EMERGENCY phone number is 920-748-8703, option 002. Since this number accesses security and maintenance personnel, please use only for emergencies. For non-emergencies, please call 920-748-8126. $10 per person includes pizza, appetizers and soda. Cash bar. Presented by the Weiske Family, all proceeds benefit Red Hawks Athletics. NEW in 2019- All-American Individual Registration includes general registration PLUS a Red Hawks gift bag, $200 per person before May 1. $130 per person standard early bird rate until May 1; $150 thereafter. Full event details and sponsorship opportunities are available online: ripon.edu/golf. Lunch, dessert and wine tasting with some all time great faculty members. Bus departs from Pickard Commons at 11:15 a.m..
$15 per person, limited availability. Join Farr Hall physics, biology and chemistry faculty for short lectures followed by building and laboratory tours with summer research students. All majors welcome! Limited seating; $45 per person includes beer and wine. Complimentary snacks provided by the Class of 1989. Members of the Class of 1969’s The Other Half will perform their seventh reunion concert. Complimentary. $10 per person includes souvenir t-shirt. $5 to play benefits the Leukemia and Lymphoma Society. An Alumni Weekend tradition hosted by Sue Angell Schmidt ’81 and Scott Nyquist ’69 with complimentary coffee, tea and juice. Enjoy a traditional Wisconsin summer picnic, honor the 100th anniversary of ROTC at Ripon, and congratulate the 2019 reunion classes. All alumni interested in supporting and celebrating diversity and inclusion initiatives on campus are welcome to join the Alumni Board for an open house. Join acting President Ed Wingenbach and College Vice Presidents for an update on the College. $40 per person includes beer and wine. $50 per person includes memory book, beer and wine. $30 per person includes two drinks. $25 per person includes beer and wine. Complimentary desserts. Music provided by the Class of 1984. All alumni are welcome to this non-denominational service organized by the Class of 1969. Remarks by Professor Emeritus Doug Northrop and Professor Brian Smith. Join Coach Alec Hoover for a 40 mile ride. Complimentary food and beverages provided afterwards.